Gracious, Spacious and Quietly gorgeous is the simplest way to describe this lovely guesthouse in the exclusive suburb of Sandhurst in Sandton, Johannesburg. 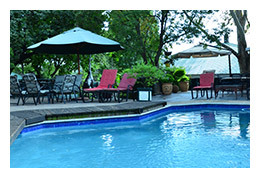 Charismatic and full of atmosphere, Elizabeth Manor has the soothing feel of the unhurried past. Sandton has fine hotels but you don’t need to trek to the sticks to find great affordable accommodation. Stay somewhere better located and more fun than many of the 5-star places. 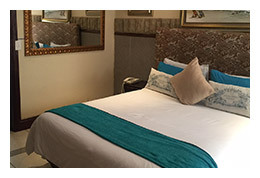 Elizabeth Manor is a traditional bed and breakfast guest house which is located within stumbling distance from Sandton City but leafy enough to be away from the mayhem of central Sandton. With its wallet friendly pricing and even friendlier staff, Elizabeth Manor will become your “go to” guest house for your Sandton visits. Lounging around the pool area, with its lovely trees, is a great space for a kick back after a trek through Johannesburg and Sandton. All rooms are clean and well appointed and have private entrances and are en-suite. There is free WiFi on site and the generous a la carte and buffet breakfast keeps our guest happy. Secure parking is on site and is free, and so is our coffee and tea! Our friendly staff are here to make you feel welcome and taken care of. 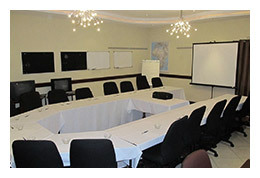 Elizabeth Manor Guest House offers superb conferencing and meeting facilities for up to 16 people, for full-day, half-day and multi-day conferences and business meetings.